Since 1896 when the company's earliest president, Riichi Satake, invented the first power drive rice milling machine in Japan, Satake's name has be synonymous with leading rice milling technology. Today, Satake's process know-how and expertise can be found in more than 140 countries around the world. Our rice milling equipment provides higher yields, less brokens, better taste and presentation, lower operating costs and most importantly higher profitability for the miller. Satake Australia can design and install complete rice milling projects, re-engineer older mills and provide spare parts and service for existing equipment. The Satake Milling Separator SFI is an all purpose separator designed for the efficient separation of large coarse material and small fine materials such as grit during the cereal cleaning process. The Satake Closed Circuit Aspirator SCA provides for the efficient, controlled separation of light impurities from cereals. The SGA family can be used for the cleaning of a wide variety of products such as wheat, maize, rice, nuts and pulses. Configured as the Gravity Selector the machine not only gives a destoning separation, but also provides a separation of heavy and light product streams. The new Satake HR10FT Super Husker is the very latest Paddy Husker built for very high capacity with the absolute minimum of breakage. Other new features include vibratory feeder, timing belt drive, new aspiration system and built-in access platform for roll changing. 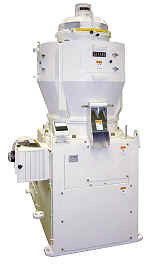 For all rice millers, improvement in milling yield is an ultimate goal. In order to attain this goal, it is absolutely necessary to obtain pure brown rice free from paddy grain. 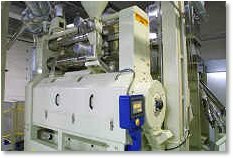 At the heart of the rice milling process is Satake's VTA Vertical Whiteners. 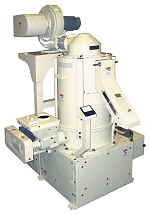 The VTA uses advanced abrasive techniques, a state-of-the-art milling chamber and controlled pressures to produce evenly milled, higher yield rice with fewer brokens and minimum moisture loss. Maintenance times are reduced and simplified thanks to innovative design features and long life components. The machine can be supplied with an electronic milling degree adjustment device for integration in to full automated plants. The friction-type vertical chamber allows a high degree of milling while minimising brokens. The friction milling provides a high quality clean finish to the rice. The milling effect may be enhanced by utilising water polishing, which is an option on this unit. A built-in in turbo fan helps to further improve the appearance of the rice and keep the milling chamber clean under demanding operating conditions. 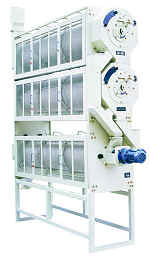 The Satake Rotary Sifter incorporates a completely new design with many first-time features developed out of years of experience and improving techniques. 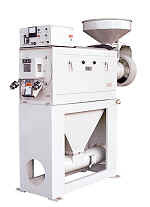 The Satake Thickness/Width Separator was developed for size separation of various grains and beans. 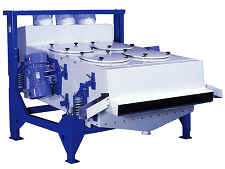 During the passage of materials through the revolving cylindrical screens, smaller grains or beans are discharged through the slots or round holes on the screen and to the outside of the machine.